This was a very difficult painting to finish. But not because of the subject. I’ve been waiting for the right time to begin a painting of Mychal, a time when my heart and my emotions would allow me to do him justice with paint and brush. This seemed like the right time. It was difficult because I had to stop several times and attend to other matters. I lost my focus. The inertia necessary to complete a painting with the original intent intact was interrupted. Not only did my paints dry on my palette and on the painting, but the emotional energy ran aground. In painting, continuity is everything. I struggled to finish it, knowing that this resolution was different from what it would have been had I not been interrupted. Most artists’ desire to paint arises from a place deep inside their soul. A vision rises within that the artist is impelled to express: capturing the illusive light of morning, shadows cast by aspens on snow, sunshine shimmering on a piece of fruit, the inner glow of a newly opened flower. We are expressing our personal vision in a language without words, hoping that the viewer can “read” our thoughts, understand our emotion, perceive our attachment to the subject matter. And, having made that connection with the viewer, we have communicated on the deepest level. I paint my life. My dearest, most precious possessions are laid out for you to see in the hues and calligraphy of my art. 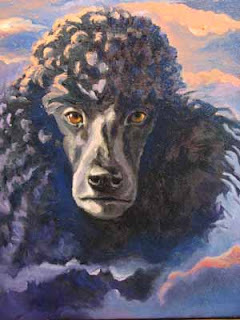 To see this expression, this painting, is to gather a glimpse of how I perceive the world around me. This is how I communicate my innermost thoughts with the universe. This is prayer, from the deepest, most unutterable depths of my soul. I cannot voice it in any other way. God has given me this voice, and as I put my paint on the canvas, I speak to Him and invite you to listen in. There’s probably a name for it in our word lexicon by now. You know, when you Google something and someone’s name whom you know shows up on the list. It happened to me the other day. I was Googling a subject, and way down the list a name caught my eye. Someone from my very distant past. Turns out he’s an authority on the particular subject I was investigating. He was the boy next door, and my first love. He had raven black hair shaved up the back, with long bangs, parted on the side hanging loosely over his forehead, shadowing green eyes with golden specks. He rode a black horse that tossed his mane the way he tossed his hair to one side. We literally grew up together, but he paid little, if any, attention to me, as far as I knew, anyway, until he came home for Christmas vacation from his first semester at college. I had, of course, been aware of his presence for quite some time. But I was a freshman when he was a senior: a vast chasm of separation in high school. I was a petite, pony-tailed country girl, and quite “under-developed” compared to most of the girls my age. His affections were then captured, I took note, by those lipstick-wearing B-cups with the teased hair and tight capris that treated me like air. And once he was off to college, where an over-abundance of those types roamed unencumbered by curfews and liberated by the Summer of Love, I turned my affections back to Elvis, who was no less attainable and every bit as gorgeous. I was, then, quite surprised by his attention that December. It seemed as if he had come home and found a new girl living next door. Perhaps he had. I was by then two months shy of my 16th birthday and not lacking for dates. 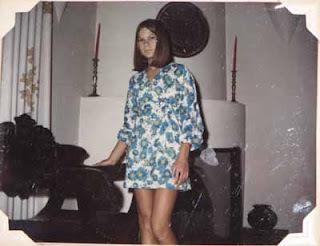 Long, straight hair was in, and hip-hugger pants with bell-bottoms were simply made for my trim little figure, shaped by good genes and years of ballet. His two younger brothers were the same ages as my two younger brothers and I was accustomed to hanging out with them occasionally, having no sister to offer a more feminine diversion. But previously it had been playing soft ball in the empty sand lot on the corner, or roaming the orchards and climbing trees, having green apple fights. Now that he was home, and could drive, he took us all to the bowling alley and the drive in. Somehow or other, I ended up sitting next to him in the station wagon, with the four little brothers occupying the other seats with their usual pre-pubescent rowdiness, oblivious to the chemistry igniting in the front seat. The first time he kissed me was in the darkened garage, after the boys had exited the car. I lingered. He put his arm around me, and moved in close. The smell of his aftershave rolled over me like a warm fog and I closed my eyes as hot, moist lips carried the combustible spark that ignited an emotion in me that I was not to experience again for more than a decade. For years afterward, I bought Aqua Velva Redwood aftershave, just so I could smell him again, and feel that burning rise up in my soul. Our romance continued when he returned to college in the New Year, and included a healthy stash of love letters scented both ways. On the margin of one he proposed, prematurely, it turns out. “When do you want to get married?” And I, being only 16 and not nearly old enough to consider it seriously, still, treasured the idea of it while dreading the thought that it had come too soon and therefore couldn’t last. Spring break brought the inevitable. I cried for days, red-eyed and unable to speak to anyone with a shattered heart that left me voiceless, as well. We moved away soon after that, and I never saw him again. I resisted the momentary urge to hit the “Contact” button on his web page. To send him a “blast from the past” email. He thoroughly broke my heart once, long ago. He was, as he said when he broke up with me, merely infatuated, not truly in love. Sara McLaughlin sings, “I will remember you, will you remember me?” Surely, he is a grandfather by now. A lifetime has passed between us. Perhaps he does remember, occasionally. But I prefer to keep my memory to myself, just in case he doesn’t. In what ways are you and your family cutting back in order to afford gasoline and the rising cost of everything these days? We started limiting our trips into town (Albuquerque) back when gas was $2.00 a gallon and it cost us about $5 a trip. Now that it’s $4.00, and everything else is going up, in some cases rather dramatically, we have pared down to the bare necessities, in order to stay within our budget. I don’t know about your income, but when people say they’re living on a “fixed income”, and usually mean a retirement income, I can relate. My husband gets a paycheck twice a month, and it’s pretty much “fixed”, too. It hasn’t gone up in years. We live on a budget, as do most folks I know. When expenses go up, something has to go down in order to balance the equation. Credit cards usually fill in the gaps. Our income has remained the same, but our middle class lifestyle seems to be deteriorating somewhat, in some respects. At least when viewed superficially, depending on what you consider deterioration, as opposed to, say, a re-alignment of priorities, a re-ordering of expectations, a re-learning of what’s truly important in life. We pretty much don’t do “vacations” anymore. Haven’t for quite some time. We decided we’d rather spend the money on fixing up our place. So, we do short, day trips, instead. Saves a bundle and there’s lots to see within a day’s drive around here. Besides, we have too many critters to go anyplace. Even the best critter sitters won’t milk a goat. We gave up spending the big bucks on big ticket items like the Ballet and Musicals and Concerts. Do I miss getting all gussied up, going out to a sushi dinner and then taking in a Broadway Show down at Popejoy Hall in Albuquerque once in a while. Yup. But those evenings used to cost what our entire gas budget for the month is, now. Something’s gotta give. Life is changing. Not only did we make a decision to re-order our lives a while back, but the economy has apparently decided that we’re on the right track, and is pushing us right along now. To save water and electricity, we quit using our dishwasher about two years ago. It’s still there, and still used, as a rather expensive, but convenient dish drain. We saved enough water every month to water our blackberry patch four times! We tore out our “zero clearance” fake fireplace with gas burning logs, and put in a Lopi Woodstove. Bought a Husqvarna chainsaw, got a permit to cut wood and saved ourselves a bundle on natural gas last winter. Fresh, crisp fall air, great exercise, wonderful picnics, the smell of fresh-cut cedar! The gas company now owes us money! I have used only cold water to wash my clothes for several years now. But this year, we went a step farther. See photo above. Hot, dry air blows most of the time around here, and it’s free. 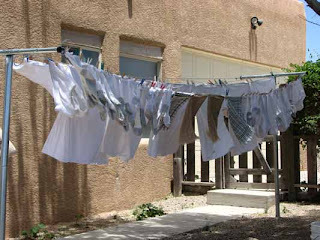 My clothes dry on the line now in about half the time it used to take to dry them using costly, and getting costlier, natural gas. There’s a real art to hanging clothes on a line. It’s almost like a prayer, or a meditation. If you do it right, as you take them down they almost fold themselves into a neat pile there in your laundry basket, ready to be put away, all sunshine fresh and snowy white! Prices for that watery stuff in plastic jugs that passes for milk in the grocery store has now far surpassed what it costs us to produce our very own pure, nutritious, enzyme-rich un-pasteurized goat milk, right here at home. We drink it ice-cold while the life energy still remains in it, just minutes out of the goat. The ultimate health-food drink! Added bonus is the kefir, chevre, cheddar, feta, mozzarella and ice cream! Have you seen what those pricey gourmet food stores charge for hand-crafted goat cheese! And we eat it on our toast for breakfast and feed it to the Apsos. Our chickens lay more eggs than we can consume in a day, and they do it with joy, élan, enthusiasm and humor. And we know what’s in those eggs, too. Not the pallid, insipid imitations that those pitiful battery-raised hens produce in their short, brutal lives that end up in polystyrene egg cartons down at the local grocery. These are the real deal! Beautiful brown eggs that resist the first crack on the cast iron skillet, then willingly divide into two equal parts to reveal the yellow eye of yolk and firm clear white that will soon be chuckling like the hen who laid it. All this for the price of half a dozen of those so-called free range eggs in the health food section at the local Smith’s. And then we have our organic garden which produces all the fresh produce we can eat during the summer and a freezer full of good eats that lasts until the garden is in the ground the next year. It’s a lot of work, watering, weeding, tending, putting up fresh picked veggies. It’s a lot of fun picking your dinner every evening, like I just did. Fresh spinach, arugula and baby romaine salad! No need to worry about salmonella or e-coli in our garden goodies. I know exactly where it came from, how it was watered and fertilized, and who picked and prepared it! I am not a lady of leisure by any measure. My hands are scarred, my nails are short and my cuticles are ragged. My neck is brown and my skin is dry and sun damaged. But my heart pounds steadily and easily in my chest, my blood pressure is enviable and my cholesterol is perfect. I haven’t even had a cold in years, much less the flu or the omnipresent sinus infections I used to get, prior to goats and garden. Our life style is our health insurance and hedge against inflation. And now, hanging my freshly washed clothes out on the line, I can even be thankful for the wind! Why Are We Doing This, Anyway? I have to remind myself on days like today. The wind continues its assault with gusts reaching 60 MPH. Dust hazes the cloudless sky. Everything is parched Why in the world are we struggling to grow food, milk goats, raise chickens, gather eggs, when everything, except the raw goat milk, is available just a car trip into town? Are we crazy for “doing it ourselves” when we could arguably spend about the same amount, or in some cases, even less, to buy the produce and protein we consume? Why are we devoting so much time and energy to doing for ourselves what can be bought? This is not an ideal environment for growing food or raising farm animals. Granted, just a few decades ago this very land on which I now reside was a dry-land pinto bean farm. This whole valley used to be the “Pinto Bean Growing Capital of the World” and proud of it! The farmers out here simply plowed their fields, planted their beans and waited for the early rains to sprout them and get them up, and the later rains to grow them to harvest. That all dried up beginning in the fifties. It was over and done by the seventies. Drought came and changed everything. The farmers tried to hang on. They dug deep, expensive irrigation wells and pumped alkaline water out of the ground to water crops that preferred the soft, nitrogen rich water from the sky. Ranchers raised fewer and fewer head of beef cattle on larger and larger acreages. Gradually, they sold out, went bankrupt, moved away. Just a handful of the “old timers” are left here, now. The Town of Edgewood incorporated around one of the last ranching and farming families in this area, when they refused to be a part of the new town. And then, ironically, they sold out to Wal-Mart! Yes, Wal-Mart. In a surreal turn of events, the very rancher who decried the loss of his lifestyle and bowed his neck in protest by refusing to sign on and become a part of the new age of subdivided ranches turned into new towns, sold out to the highest bidder, after all. Where cattle grazed and antelope roamed now sits a Wal-Mart Super Center; paved paradise turned into a parking lot. Still, this area of arid New Mexico is accustomed to receiving about 12 inches of moisture each year. We usually get about six inches of rain in the spring and during the late summer monsoons, and enough snow in the winter to account for the other six inches of moisture. It gets cold, but rarely dips below zero. The wind blows in the spring, as it does in most western states, sometimes furiously. It’s just a fact of life. But this spring feels different. The weather is crazy all over the country. The whole world seems in turmoil. Earthquakes, volcanoes, typhoons are ravaging parts of the world to which I have never given much thought, prior to seeing the suffering faces on the news and in the paper. And right here in the good ole safe USA, tornadoes are putting peoples lives through the blender of destruction, floods are ruining homes and crops and lives and drought is sucking the life out of the rest of us. The Earth is growling her warning. Her lips are curled in a defensive snarl. She is rumbling her displeasure and spitting her anger. I look to the sky daily and wonder if this could be the day when HE returns to claim His own and His Earth. No man knows the date or time. All things foretold have been fulfilled. The last sign is simply His coming, which He has told us will be sudden, without warning, apart from the signs of the Earth. And so I wonder, daily, nightly, when the wind howls and the sky is angry and the nightly news reports our Mother’s latest tirade and tantrum against her spoiled and uncaring children. Is today the day? And if so, that answers my question. This has been one of the nastiest springs in recent memory. Late spring freezes killed all the blossoms on the fruit trees and damaged the blackberry canes where the sap was beginning to rise. Erratic temperatures have caused delayed growth in almost everything. There simply were no spring rains at all. The wind has not quit blowing since March. Fifty mile an hour winds have been blowing all week long. They awaken us in the night with their fierce thrashing and continue on mid-day, raising huge dust clouds and desiccating everything in their path. Were most of our garden not covered with cold frames, it, too, would be gone with the wind. Nothing can, or wants, to stand up to it. The trees are whipped around so violently that I don’t know how it is that their limbs remain intact. And, in fact, the leaves are whipped off them like dust off a shaken rug. Snap! And the yard is full of fresh, green leaves and small branches that are supposed to be soaking up sunshine. The sound of it is frightening, and discouraging. It beats against the house and roars through the trees. They say the strong, hot, dry wind zaps all the negative ions and makes us feel irritable. At the very least! I am weary of it all. My heart longs for a gentle spring with wildflowers blooming across the green meadow, freshened with rains that nourish but don’t overwhelm with their goodness. Soft, cool breezes that waft away the perspiration. Warm, but not hot. Just enough humidity to soothe, but not oppress. Don’t want much, do I? I’d settle, quite happily, for less wind. However, I am extremely thankful that we have not had a tornado here. There have been no golf ball-sized hail, or even large marble-sized hail. It has not flooded here, and probably never will. We have not had any earthquakes, although this area is in an active fault zone. Fire has not visited its wrath on us, either. We just have this unrelenting, brutal wind. I am praying that God will enable me to be thankful for it, too. I’m a native New Mexican, raised in the rural tradition of the small village of Corrales, north of Albuquerque. My husband and I live on a tiny subsistence farm in the foothills of the Sandia Mountains, east of Albuquerque and south of Santa Fe. Together we strive to live more simply, separated from the intensity of city life, deliberate in our intent to remove ourselves from dependency on corporate America. We acknowledge our total dependence on the provisions of our Creator. All that we have is a gift from God. The myriad daily chores that keep me close to the earth are a constant reminder of that dependence.